We specialize in offshore fishing charters and deep sea fishing charters. We offer the best fishing in Galveston. 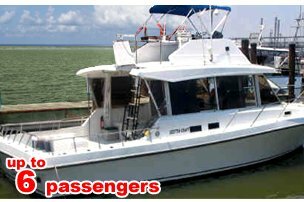 Galveston Bay fishing, offshore fishing trips and charters, Galveston Jetty trips, and near shore charters. Bay and jetty fishing, and tuna trips providing fishing fun for families, friends, out of town guests, business clients, organizations and corporate entertainment. We offer some of the Best Galveston Jetty Fishing trips and deep sea trips on the coast. Our deep sea fishing – Kingfish, Ling (Cobia), Dorado (Mahi-Mahi), Shark, Red Snapper, Mangrove Snapper, Lane Snapper, Grouper, Spanish Mackerel, Blackfin Tuna, and much more. Galveston Bay & Jetty Fishing – Bull Redfish, Shark, Black Drum, Spanish Mackerel, Gafftop, and much more. Let’s Go Fishing! A 50% Deposit is required to confirm your reservation. Trip prices do not include customary crew gratuity of 15-20% or fish cleaning services.